Beale continued his road west from the mouth of Canyon Diablo past Cosnino Caves (see the “WHIPPLE” section) and on to the foot of the San Francisco Peaks. The road continued through what is now Flagstaff and then on to Leroux Springs. Jack Beale Smith has located the road and marked it with commemorative signs in several places around the city of Flagstaff. Modern highways and streets in Flagstaff follow Beale’s road in many places. 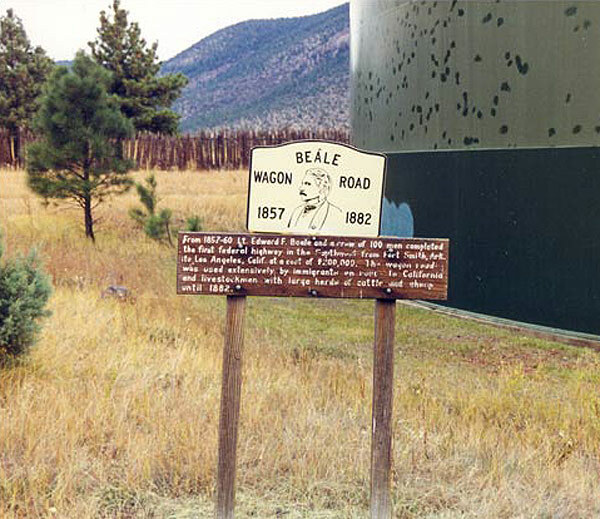 One of many signs placed by Jack Beale Smith to mark the Beale Road. This one is on top of Switzer Mesa in Flagstaff. Tom Jonas photo. 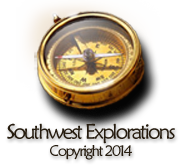 West of Flagstaff, Beale followed near Whipple’s trail past modern Williams but instead of turning southwest along the Bill Williams River, Beale turned northwest beyond modern Seligman and built a road through Peach Springs and then Kingman. Much of Beale’s road alignment was used for the railroad grade in the 1880s and for Route 66 in the 20th century.